Lamrim Yeshe Nyingpo (Tib. ལམ་རིམ་ཡེ་ཤེས་སྙིང་པོ་, Wyl. lam rim ye shes snying po), the 'Gradual Path of the Wisdom Essence' — a terma revealed by Chokgyur Dechen Lingpa and Jamyang Khyentse Wangpo, to which Jamgön Kongtrul wrote a famous commentary. Also Mipham Rinpoche wrote a topical outline for this treasure text. Mipham's topical outline (Wyl. zhal gdams lam rim ye shes snying po’i bsdus don) is in his collected works Vol. 8, ff.435-462. Padmasambhava & Jamgön Kongtrul, The Light of Wisdom, translated by Erik Pema Kunsang (Boudhanath: Rangjung Yeshe Publications, 1986-2001). 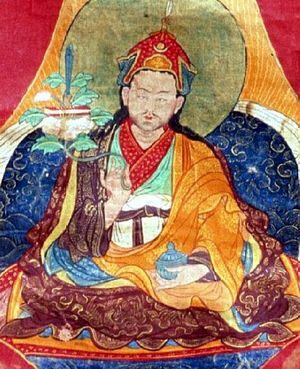 a collection of notes: Entering The Path of Wisdom, by Jamyang Drakpa as recorded by Jokyab Rinpoche, supplemented with clarifying remarks by H.H. Dilgo Khyentse and H.E. Tulku Urgyen Rinpoche. 24 July-3 August 2013, Vol. I, Section Three cont. & Vol. II. Mainly oral transmission of Vol. III-IV-V, with some explanations and comments. This page was last edited on 21 January 2019, at 11:59.